Do you know someone that loves learning about maps, their history, and how they are made? The The Writer’s Map: An Atlas of Imaginary Lands provides this information and much more! You will get a recollection of imaginary worlds and stories behind some of your favorite authors. Get ready to go on a visual journey to some of the most unique places. It’s one of the first things we discover as children, reading and drawing: Maps. Maps have a unique power to transport us to distant lands on wondrous travels. Put a map at the start of a book, and we know an adventure is going to follow. Displaying this truth with beautiful full-color illustrations, The Writer’s Map: An Atlas of Imaginary Lands is an atlas of the journeys that our most creative storytellers have made throughout their lives. This magnificent collection encompasses maps that appear in their books. As well as the many maps that have inspired them, the sketches that they used while writing. With over two hundred full-color images, ‘The Writer’s Map‘ is an atlas of the journeys. Journeys that some of our most creative storytellers have made throughout their lives. This magnificent collection includes not only the maps that appear in their books, but also the many maps that have inspired them, the sketches that they used while writing, and others that simply sparked their curiosity. 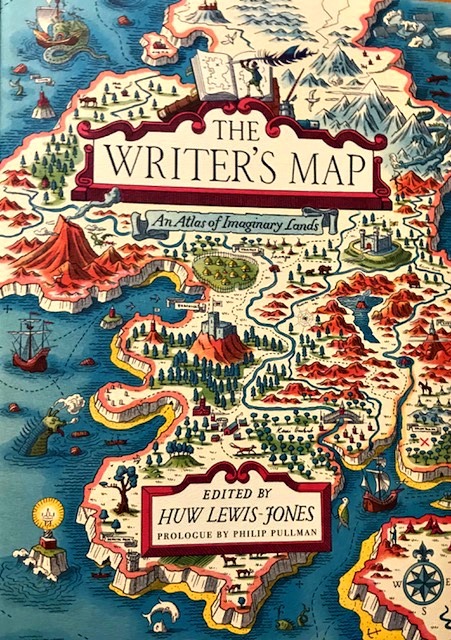 There are essays from Philip Pullman, David Mitchell, Robert McFarlane, Miraphora Mina (Harry Potter Marauder’s Map creator), Lev Grossman, Brian Selznick, Daniel Daniel Reeves (Middle Earth mapmaker), and many more. Amid a cornucopia images, we find here maps of the world as envisaged in medieval times. As well as maps of adventure, sci-fi and fantasy, nursery rhymes, literary classics, and collectible comics. An enchanting visual and verbal journey, The Writer’s Map will be irresistible for lovers of maps, literature, and memories—and anyone prone to flights of the imagination. If you love or know someone that loves learning about maps and their history, The Writer’s Map is the perfect gift. Do you love maps? What is your favorite place to visit? I just got my copy, and it’s gorgeous! Maps (and floor plans) automatically make a book better!